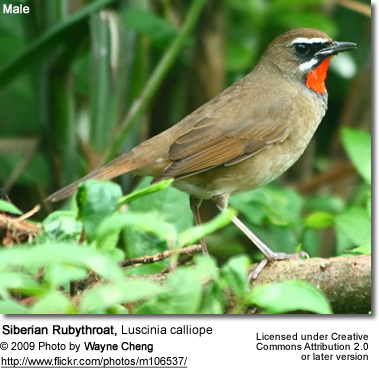 The Siberian Rubythroat, Luscinia calliope, is a small passerine bird that was formerly classed as a member of the thrush family Turdidae, but is now more generally considered to be an Old World flycatcher, Muscicapidae. It, and similar small European species, are often called chats. It is a migratory insectivorous species breeding in mixed coniferous forest with undergrowth in Siberia. It nests near the ground. It winters in India and Indonesia. 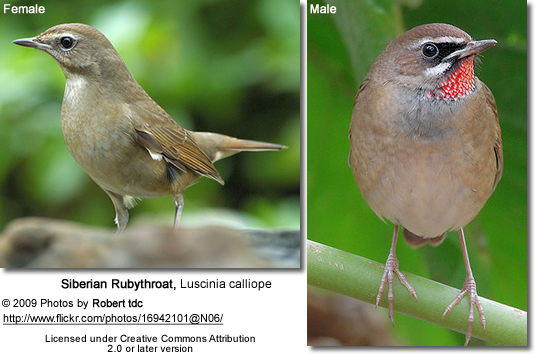 The Siberian Rubythroat is slightly larger than the European Robin. It is plain brown above except for the distinctive black tail with red side patches. It has a strong white supercilium (line above eye). 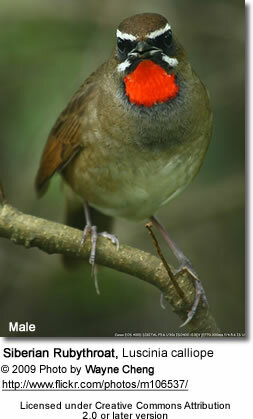 The male has a red throat edged with a narrow black and then a broad white border. It has a strong white supercilium (line above eye). 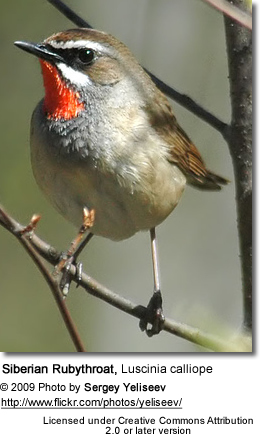 Females lack the brightly colored throat and borders. The male has a song like a harder version of the Garden Warbler.